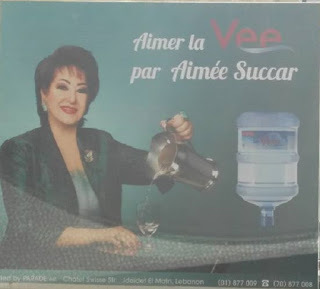 Aimee Succar, self-branded etiquette and savoir vivre expert, who has graced the Lebanese airwaves since the 90s (note, even back then she had greyish hair which has now disappeared), has apparently launched "Vee" her own brand of bottled water called "Vee" which is close to "vie" in French which means "life". The internet backlash was too harsh, I am not sure what upset people the most: Is it how she is flawlessly pouring water while not even looking? Is it how is seen by many as a relic from a distinct era (think Simon Asmar heyday at LBC)? Is it the odd branding (why a brand of water, not say a facial mask collection)? Or is it the rather odd advertising in itself? It could be any, or all, of them.